Okay, we've seen some bad examples of dealership websites. But have you stumbled upon ones that didn't make you want to throw your phone at the wall? I was sooooooo missing 1998. Windows 98 was awesome too. WHOA, hold it there. This thread is dedicated to PISS POOR UX, not good sites. Go dig in the dB for the various threads on excellent website vendors. We tend to steer UX outcomes toward our notions of right and wrong. Improving UX requires a level of selflessness that's difficult to master (me included). Artistically pleasing layouts is one tool needed to improve UX. In my DIY world of trying to improve UX, my goal was "to create a shopping experience where the shopper left our site smarter than when they arrived". Improving UX requires removing obstacles to consumption. UX improvement in the car dealer space requires a deep understanding of the buyer and the seller. UX gurus love their face-time talking to car shoppers or shadowing car salesmen. They surf thru thousands of emails and chats looking for ideas or themes. A great UX'er UI comes from a deep deep understanding of what the shopper AND the dealer wants and needs. Ask her how many VDP views she gets? She won't know or care. She doesn't track website or advertising stats either. 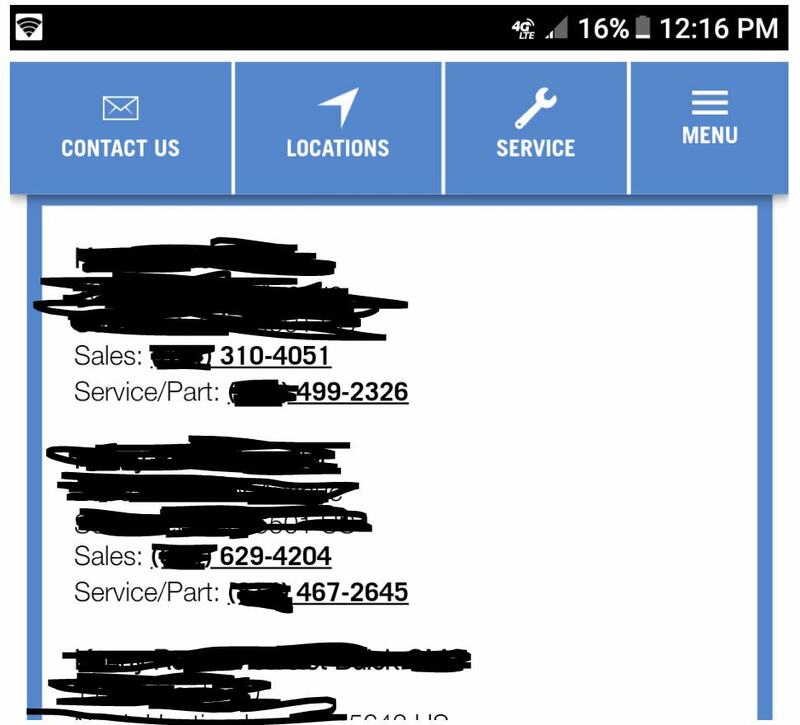 So, I'm still looking for a vehicle and when I click a local group's phone number, by default my mobile phone brings the International Calling Code firstly, not Area Code. LMFAO! Nice work CDK! I bet the dealer doesn't even know or zero QA was done in this area and this is their main site among 20 tops. I wonder how many leads or pissed customers were dropped over the years? A free code from World Zone 2 seemed to be the next best choice. Faroe Islands (+298) and Greenland (+299) are in the northern Atlantic, between North Americaand Europe. But for many years, there were no available country code assignments in the traditional European zones (World Zones 3 and 4). You've hit a roadblock! Unfortunately, what you're looking for isn't here, but we can still help you find what you need. Use the links below to detour to some of our most popular destinations. Or, use the search feature at the top of the page to find exactly what you're looking for. 2 slashes in URL. Enough to break a system.